1997, Starring Nicole de Boer, Nicky Guadagni , David Hewlett, Julian Richings, Wayne Robson, Maurice Dean Wint. Directed by Vincenzo Natali. 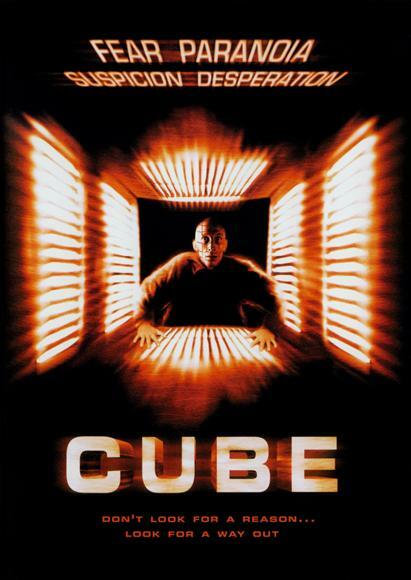 Made with the help of Norman Jewison's Canadian Film Centre, Cube is a film about five characters who suddenly find themselves being held in a large cube, made up of smaller cubes that connect through steel doors in the middle of all 6 sides of the individual "cells." 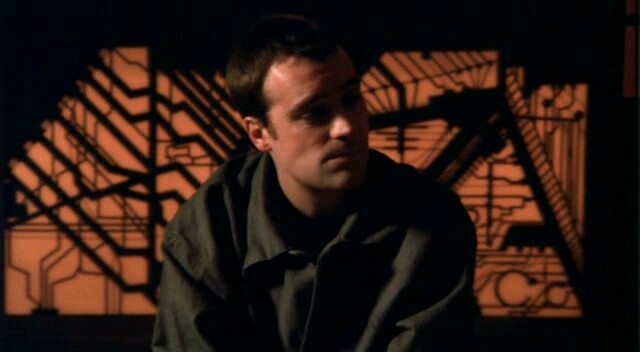 Since "who" and "why" are part of the mystery of the cube, the movie launches directly into the plot where we meet our characters: Rennes, an old prison escape artist, Worth, a cynic who may have unknowingly built part of the cube (played by David Hewlett, who starred in Pin), Holloway, a female doctor who is convinced that the cube is a conspiracy, Leaven, a privileged girl who has expertise in math, and Quentin, a cop and natural leader. After trying to figure out where they are, the party decides to move through the cube based on the logic that they have to reach the edge sooner or later. That's when Rennes discovers that certain cells are booby trapped with a variety of flame throwers, razor sharp wires and gases-- he gets acid sprayed in his face and dies. 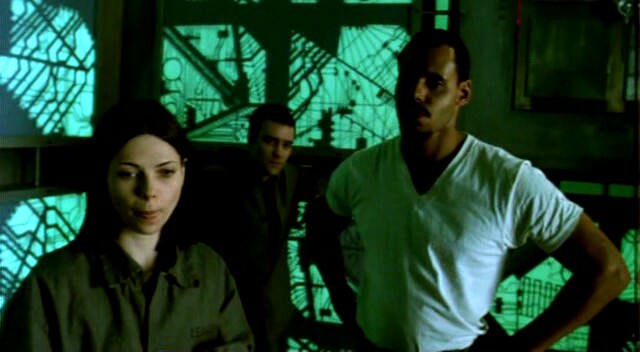 As Quentin continues to lead them through the cubes, Leaven finds that each cell has a nine digit number plate, and figures out that if any of the three, three digit sequences are prime numbers, the room is trapped. Based on this, they continue on until they happen upon an idiot savant named Kazan, also trapped in the cube. Conflict in the group begins to take shape as Quentin thinks that Kazan should be left behind and that Worth is a mole. Under the duress of Quentin's fists, Worth confesses that he helped to build part of the outer shell and offers some insight into why the cube was built. Apparently the cube is some kind of government public works initiative that got passed off so many times, the original purpose has been long lost. Worth explains he was one of many contractors who preferred to do their job and not question the bigger picture. After Kazan accidently causes Quentin to get hurt, group tensions are bumped up another notch. But now Holloway begins to question Quentin's violent streak, as well as his leadership. Meanwhile, the group continues through the rooms, with Leaven modifying her number theory-- she now believes that the number plates now represent Cartesian coordinates. When they finally reach the last cube and open the door to the outside shell, they find a 14 foot gap between the cells and the outer wall, and no door in sight. Trying to get a closer look, Holloway swings to the outer shell on a rope of prison jackets, but when trying to get back inside, Quentin maliciously lets her fall to her death. And it doesn't end there. Leaven modifies her number theory once again, Kazan finally reveals his usefulness, and Quentin's madness grows out of control in a desperate bid to escape. And then there's the mysterious clanging sound that keeps rocking the structure. Cube is very similar to an episode of the old Twilight Zone show called "Five Characters in Search of an Exit," in which five people, wearing different uniforms (soldier, ballerina, etc.) find themselves prisoners inside a featureless cylinder. After trying to escape, it is revealed to the audience that these characters are dolls in a Christmas toy donation drop. Although we don't have the same kind of clear twist ending here, there are definite similarities in the stories. Even though this film takes place on a series of soundstages, they managed to work in some Canadian references. When Rennes gets hit with the acid, he says "Merde! ", and Holloway even refers to "making widgets in Saskatoon" in trying to explain the existence of the cube. This film is really about the way these five people relate to each other. If they all worked together and had fun and learned about themselves, this would be a Hollywood blockbuster starring a nurturing Denzel Washington instead of maniacal Maurice Dean Wint. At first, Quentin is the typical Hollywood hero of the film, but it is those very traits that end up terrorizing the others. The real heroes turn out to be those without any tangible leadership qualities. Overall, Cube is a consistently watchable film. It's not really a personal favourite, but like Ginger Snaps, it's a good modern entry point into the darker side of Canadian films.